This pen-and-ink cartoon sketch commemorates the Philadelphia SPHAS’ 1936–37 American Basketball League (ABL) championship victory. That triumph echoed their success during the prior season (1935–36), when they had also claimed the ABL championship. 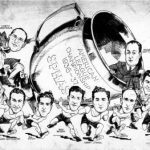 Formed in 1917 by Eddie Gottlieb, Edwin “Hughie” Black, and Harry Passon, the Philadelphia SPHAS won several basketball championships in the country’s premier basketball leagues. The SPHAS had a strong connection to Jewish culture and their name derived from the acronym for the South Philadelphia Hebrew Association (SPHA). The team was primarily composed of Jewish athletes and was a favorite among Philadelphia’s Jewish population. Fans flocked to the Broadway Hotel on North Broad Street to see the team’s home games. The team maintained its Jewish identity throughout its existence. The team finally folded in 1959 after more than forty years of competing. 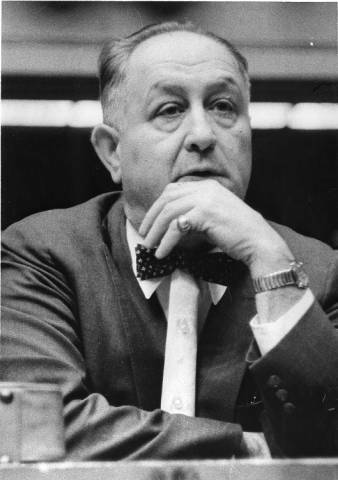 Eddie Gottlieb assumed many roles in his basketball career, including coach, owner, and promoter. Under his leadership the Philadelphia SPHAS, a team he had a hand in creating in 1917, achieved their greatest success, capturing multiple championship titles and establishing themselves as a force to be reckoned with in basketball. Gottlieb was instrumental in the merger between the Basketball Association of American and the National Basketball League, which ultimately became the modern, premier basketball league, the NBA (National Basketball Association). 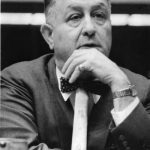 Gottlieb demonstrated a brilliant mind for basketball in coaching the SPHAS to championship success, but he also enjoyed success as owner of the Philadelphia Warriors, which won an NBA championship in 1956. 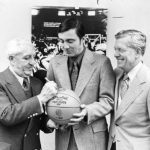 Gottlieb was inducted into the Naismith Basketball Hall of Fame in 1972. 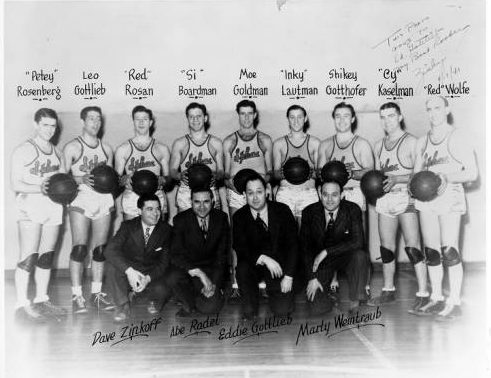 Eddie Gottlieb poses alongside his players during the team’s tenure in the American Basketball League. 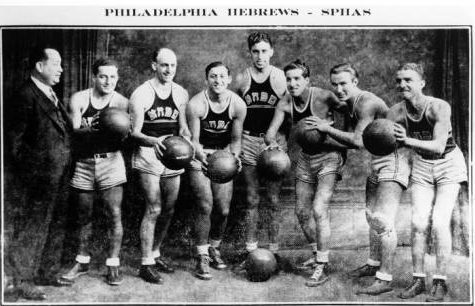 The Sphas players are garbed in their iconic uniforms which included Hebrew writing on the front of their jerseys, thus paying homage to the team’s Jewish heritage and cultural roots. (Sphas pictured from right to left: Manager Eddie Gottlieb, Harry Litwack, George Wolfe, Inky Lautman, Lou Forman, Gil Fitch, Shikey Gothoffer, and Cy Kaselman). A Philadelphia SPHAS team photo (c. 1940) pictures players along with the team’s coaches and staff. 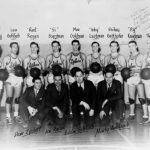 Active as a team from 1917 into the 1950s, the SPHAS were moderately successful in both the Eastern Basketball League and American Basketball League. After being sold by Eddie Gottlieb in 1950, the SPHAS became the Washington Generals, the team best remembered for consistently losing to the basketball entertainment team, the Harlem Globetrotters. 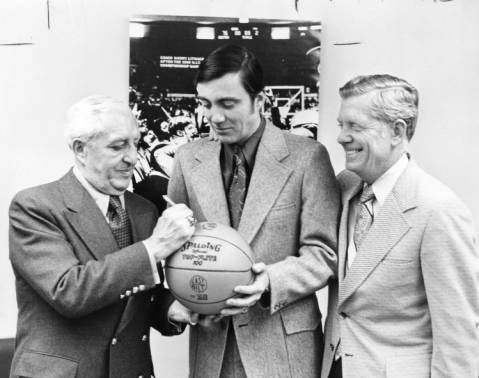 Harry Litwack became an accomplished basketball coach for Temple University, and here he is pictured (far left) autographing a ball alongside Temple Athletic Director Ernie Casale (far right). Litwack holds a special distinction in the Philadelphia Sphas organization as a former player who would return to the team as a coach, as when Eddie Gottlieb went on to coach the Philadelphia Warriors in the Basketball Association of America, it was Litwack who stepped up to lead the SPHAS. In 1917, a group of Jewish high school graduates in Philadelphia formed a basketball team that competed against other local teams. 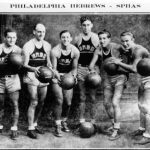 Affiliated with the Young Men’s Hebrew Association (YMHA) at first, the team soon became known as the SPHAS (South Philadelphia Hebrew Association) after the YMHA withdrew its sponsorship because it considered the sport too violent. Except for a couple of seasons in the 1920s, the team kept the name SPHAS until it disbanded in 1959 after achieving a long record of success. Eddie Gottlieb (1898-1979), Harry “Chickie” Passon (1897-1954), and Edwin “Hughie” Black (1897-1986) organized the team after graduating from South Philadelphia High School. Black and Gottlieb, who then attended the School of Pedagogy at Temple University, joined with Passon and other friends to compete in the minor league American League of Philadelphia for two seasons with the support of the YMHA. Next, the SPHA sponsored the team, and even though the organization soon withdrew its support, the team retained the name. By the early 1920s, the SPHAS no longer needed sponsorship after Gottlieb, Black, and Passon opened a sporting goods store to provide their own uniforms (by the end of the decade, Passon bought out his partners to form Passon Sporting Goods, which became Philadelphia’s leading sporting goods store). The SPHAS played in the American League until 1922, then spent one season in the Manufacturer’s League, which mostly consisted of company teams. Philadelphia Jews ardently supported the team, which continued to play with a majority of Jewish athletes. Other teams also had Jewish players, but they were most dominant on the SPHAS. Fans packed the ballroom of the Broadwood Hotel on North Broad Street to watch the SPHAS Saturday night games, then went dancing after the games. The team also retained a connection with Temple University, which served as a local college pipeline for players. 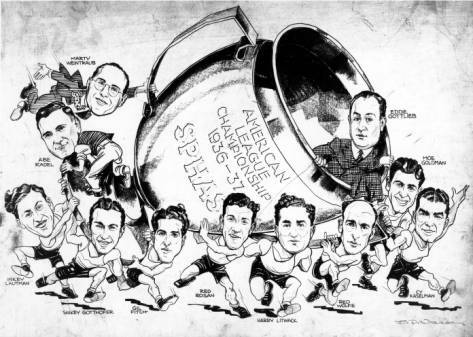 The team won its first professional title at the end of the 1923-24 season, while playing in the Philadelphia League. Under Gottlieb’s leadership, the SPHAS became one of the top teams in Philadelphia and traveled to play outside the regional league. After one season (1926) in the short-lived Eastern League, Gottlieb scheduled games against teams competing in the American Basketball League and prominent barnstorming teams, including the Original Celtics and New York Renaissance (the Rens). After playing for one season (1926-27) as the Warriors in the American Basketball League, the team once again became the SPHAS and joined a revived Eastern Basketball League for 1929-30. Clearly the best team in the league, with a new star in future Temple University basketball coach Harry Litwack (1907-99), the SPHAS won the league’s championship in three of the four years of its existence. Success continued between 1933 and 1947, as the SPHAS reached the playoffs twelve times and won seven championships in a new American Basketball League (ABL), formed in 1933. The team continued to play in the ABL after it reverted to a minor league following the 1945-46 season, with less success. Meanwhile, Gottlieb became coach and general manager of the Philadelphia Warriors as a franchise in the new Basketball Association of America (forerunner of the National Basketball Association) and he brought some of the SPHAS’ top players with him. Litwack, who also coached Temple’s men’s basketball team, took over as coach of the SPHAS. 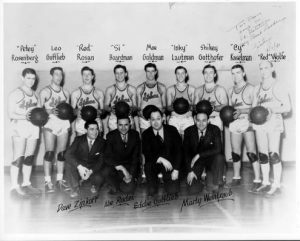 In 1950 Gottlieb sold the SPHAS, and former star Louis “Red” Klotz (1920-2014) found a new role for the team as one of three touring opponents for the Harlem Globetrotters. Klotz changed the team’s name, first to the Washington Generals in honor of President Dwight D. Eisenhower (1890-1969) and later to the Baltimore Rockets. Under Klotz’s leadership, the SPHAS went from being a championship-caliber team to the brunt of the Globetrotters’ hijinks. The SPHAS officially ceased operations in October 1959 but could look back on success as one of Philadelphia’s championship basketball teams from the first half of the century. To the end, the team retained its predominantly Jewish identity. Stark, Douglas. The SPHAS: The Life and Times of Basketball’s Greatest Jewish Team. Philadelphia: Temple University Press, 2011. Philly Hoops: The SPHAs and the Warriors. Directed by James Rosin. Alpha Home Entertainment, 2010. Philadelphia Jewish Archives Center, 615 N. Broad Street, Philadelphia. Site of the Broadwood Hotel (SPHAS Historical Marker), 320 N. Broad Street, Philadelphia.